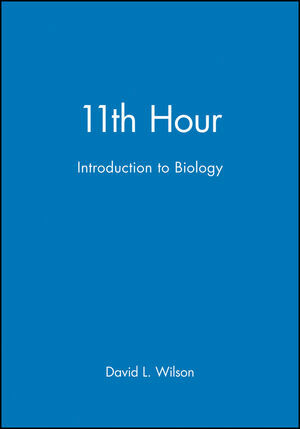 David L. Wilson is the author of 11th Hour: Introduction to Biology, published by Wiley. Unit I: From Atoms to Living Cells. 2 Atoms, Bonds, Water, and Carbon. 3 Molecules and Macromolecules of Life. 4 Membrane Structure and Function. 7 Energy Metabolism and Cell Respiration. Unit II: Genes, Information, and Heredity. 9 DNA: Structure, Function, and Replication. 10 RNA and Protein: Transcription, Translation, and the Genetic Code. 11 Cell Cycle, Mitosis, Meiosis. 13 Recombination, Linkage and Mapping. 14 Genetics of Bacteria and Viruses. 15 Gene Expression, Gene Technology, and Human Genetics; Exam II. 16 Evolution and Natural Selection. 17 Microevolution and Population Genetics. 18 General Principles of Physiology. 20 Endocrine System and Hormones. 21 Neurons: Electrical and Synaptic Events. 22 Immune System and Body Defenses. Additional information provided on the internet site related to this topic.